Both adaptive and multi bitrate streams are published through multiple (usually three) streams with the same content but in different bitrates (high quality, medium quality and low quality). There are two types of CDN Live services - with Pull Publishing and with Push Publishing. Please refer to Differences between pull and push publishing for more details. In the following we will describe all necessary steps for both CDN Live service types. Please refer to Creating a CDN Live service for more details. Please note that your origin live streams have to be published over RTMP protocol in MP4 or FLV container format and encoded with H.264 video codec and AAC or MP3 audio codec. Let's assume that your new CDN Live service with Push publishing has the following properties (Please refer to Services/How-To). On the "Encoding Options" tab define your desired multiple bitrates as in the picture below. If you plan to stream over HLS protocol then make sure that H.264 is selected as output format above. 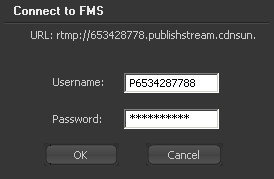 On the right hand side in your FMLE fill in your FMS URL rtmp://6534287788.publishstream.cdnsun.net/P6534287788 and choose your desired stream name (mystream in the picture below) followed by _%i as in the picture below. Please note that %i is a wildcard for 1, 2, 3 as we have defined three outputs. Click on the "Connect" button and fill in your Username P6534287788 and Password Kmx7s14We as in the picture below. Finally click on the "OK" button. Let's integrate your adaptive & multi bitrate CDN live stream via JW Player on your URL http://www.mycompany.com/index.html. Let's assume that 6534287788.r.cdnsun.net is the Service Identifier of your CDN Live service and that audio bitrate in all your three live streams is 32 Kbps. Create a SMIL description file of your multiple bitrate live stream with the following content and upload it on your URL http://www.mycompany.com/multi.smil. from the Services/How-To page and the RTMP URL above ("/mystream" at the end is missing). 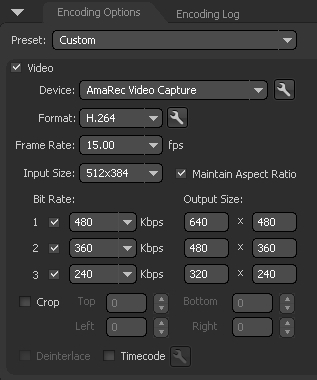 Also please ensure that all three "src", "width" and "height" attributes correspond to your settings in your Wowza or Adobe Flash Media Live Encoder. For "system-bitrate" please use the following formulae. 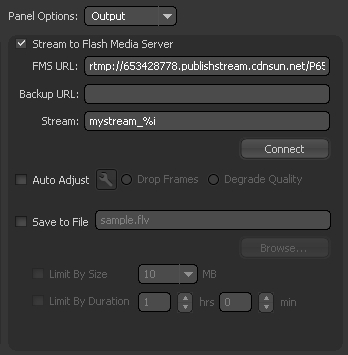 Create an m3u8 description file of your multiple bitrate live stream with the following content and upload it on your URL http://www.mycompany.com/multi.m3u8. from the Services/How-To page and the HLS URLs above. The chunklists must be in the format chunklist_wNUMBER.m3u8 where NUMBER is an integer between 1 and 9999999999. Additionally the NUMBERs must be unique within the file. It is also recommended to generate them randomly for every request (using PHP, Ruby, Python, etc.). Also please ensure that "width" and "height" attributes correspond to your settings in your Wowza or Adobe Flash Media Live Encoder. For "BANDWIDTH" please use the following formulae.